Chasten Buttigieg, who is married to gay presidential hopeful Pete Buttigieg, has become something of a personality in his own right over the past few months, thanks in part to his lively Twitter presence. At a Human Rights Campaign event in Houston, Texas on Saturday, Buttigieg peppered a speech about LGBTQ rights with good-natured humor. “I could be the first man in history to pick out the White House china,” Buttigieg said about what would be his role as the husband of the president if Pete Buttigieg were to go all the way. Buttigieg also joked that he’s lost some anonymity since his husband, the current mayor of South Bend, Ind., announced he was running for the Democratic nomination. He is now subject to having his picture taken by strangers in the “deodorant aisle of the grocery store," he said. 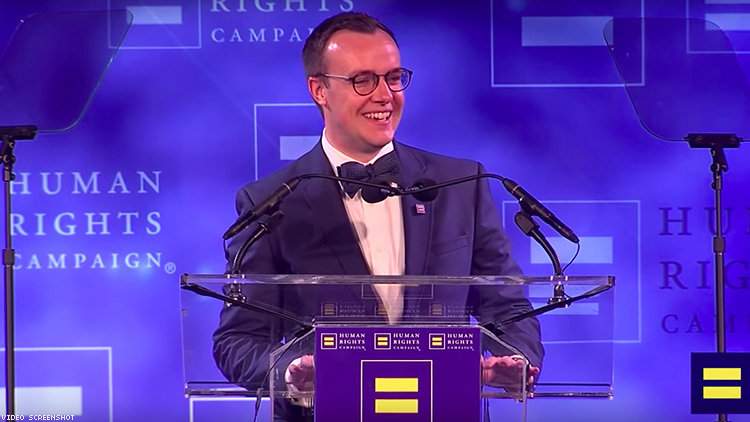 A Michigan native, Buttigieg spoke candidly about how he moved out of his parents’ Traverse home when (at the time) they could not accept him for being gay. “My husband Pete Buttigieg – you can call him "Mayor Pete" – was commissioned as a naval intelligence officer when ‘don’t ask, don’t tell’ was still the law of the land. And served a seven-month tour in Afghanistan when a certain vice president was governor of his home state,” Buttigieg said. He also spoke about the importance of getting the Equality Act signed into law. The legislation, introduced in Congress last this month, would amend federal law to provide a wide range of protections against discrimination based on sexual orientation and gender identity. It would ban discrimination not only in employment but in housing, credit, public accommodations, education, federal financial assistance, and federal jury service. And Buttigieg said that his husband is the guy who could make the Equality Act happen. “We need someone in the White House who will sign the Equality Act into law, and luckily I know a guy,” he said.